Our essential guide to the latest games on iOS platforms. Today, we take a look at what's new and exciting on the iOSApp Store. Strategy fans will enjoy the latest entry in the Civilization series, converting PC gamers to mobile maniacs with the iOS exclusive Civilization Revolution 2. If you're a fan of 2D platformers, Buzz Killem makes his debut, kicking green alien butts and taking names in this action packed shooter. In addition, there's puzzle fantasy adventure, The Bearded Hero. On that note, here are a few games to get you through the holiday weekend. Sid Meier's Civilization Revolution 2 returns to the mobile platform to challenge players to build a glorious empire that will stand the test of time. Developed and available exclusively for mobile devices, Civilization Revolution 2 offers mobile strategy fans a brand new 3D presentation and more tactical depth than ever before. Strengthen your military might with brand new combat units including Aircraft Carriers, Jet Fighters and Special Forces. Use new technology in a race to science supremacy using lasers, modern medicine and Information Technology. Reenact historic events and battles in the scenario mode with updated 3D graphics taking full advantage of iOS devices graphical capability. Find out if you have what it takes to rule the world! Dive into the world of Barrel Blunder! Use the springboards to successfully get the divers into the barrel. Reinkout Entertainment's cartoonishly crude humor challenges you to take a dive in the hopes that you hit the goal. Position the springboards, measure your power and launch your diver into the barrel. Join the Bearded Hero on a clay-made adventure from developer Bulkypix, who brought us Heli Hell. Help the Bearded Hero through seven challenging and mind-bending worlds to collect magic rings in order to defeat the evilings. In the Bearded Hero, players are challenged with over 35+ puzzles and secrets to unlock. In developer Captive Games' new release, monkeys love bananas and will do anything to get them. They've stolen a bicycle and are on the hunt for bananas to feed their hungry tummies. It's your job to help the hungry monkeys collect bananas. Control the speed and balance of their bicycle as they race along the trail collecting bananas. Challenge your friends to see who's the king of the monkeys. Retired War Veteran and father to Bill, Bill Killem, is called back into action after an Alien welcoming party invades Earth. Embark on missions of explosive proportions as you save America from the wrath of alien invaders. Return to peaceful and pleasant tourist locations like the Statue of Liberty and Grand Central Station to defend them from being destroyed. Play through multiple stages with tons of unlockables, new outfits, new guns and power-ups in this retro platformer. Embarking on a universe-shattering quest to save her parents from the clutches of Dr. Herbert, brave the depths of the caves to reach the hollow halls of Herbert's lair. Fight hordes of enemies to defeat Dr. Herbert for good. Use unique weapons against different enemy types and six diabolical bosses. Upgrade Cally's attributes and grow more powerful using new RPG mechanics. 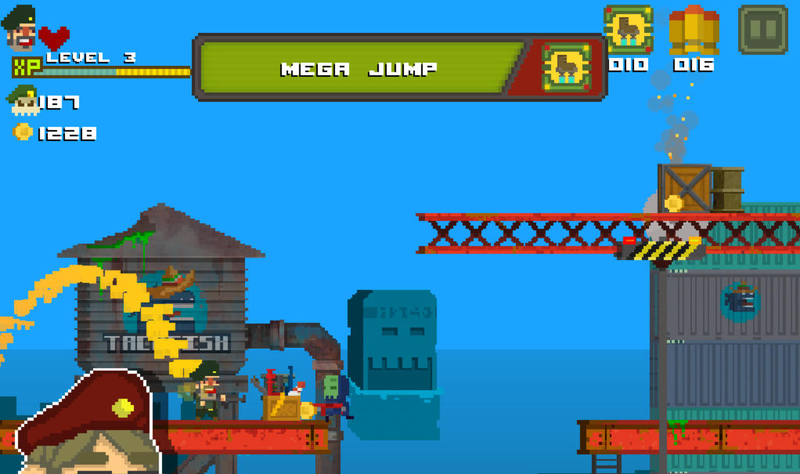 Level up each weapon separately and watch them transform into massive instruments of destruction. Venture through 104 levels upgrading Cally on her journey to rescue her parents. Cargo King puts your decision making skills and knack for precision to the test. It's a relaxing physics-based balance game of quick decision and royal precision. Stack your cargo boxes as high as you can to build a splendidly balanced and elegant tower worthy of its skillful master. Bring your reflexes to perfection, reach greater heights and get your well-earned rewards. Know that you've gotten a short preview of each game, let us know which ones we're your favorite in the comments below.